The NORKs will have a nuclear-tipped ICBM in the foreseeable future unless something is done to prevent this from happening. What that “something” is remains to be seen. One thing is clear: it cannot be more of the same as this has amounted to essentially nothing. Economic sanctions can be effective, as the Iranians learned over the past several years. However, for economic sanctions to work, there cannot be a way for the sanctioned country to replace those items that have been sanctioned–and we learned this week that China has, to some degree, allowed this to happen as they were the ones violating the UN approved sanctions. One of the ways to really ensure that these sanctions could work–on the high seas, anyway–is a naval blockade. The US and its allies could do this, but it’s risky. The NORKs have already indicated that the sanctions are an act of war; naval blockades usually are attributed to this as well, though obviously, the risks with a blockade are elevated to a much higher degree. 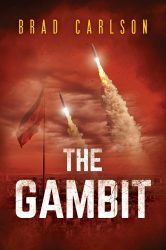 The bottom line, though, is that unless something else is done, the NORKs will have their nuclear-tipped ICBM relatively soon–possibly sooner than anyone realizes. Iran is a far greater threat than I believe most people realize. They are currently the predominant threat in the Middle East having been a huge regional beneficiary of ISIS’s demise. For the most part, wherever ISIS had established itself, Iran can be inserted, if not in terms of actual “boots on the ground”–though there are plenty of IRGC/Quds forces on the ground–then most certainly in terms of influence extending all the way across Iraq, through Syria and into much, if not most, of Lebanon–and the Israelis are watching. In addition, Iran continues to foment regional discord with their very generous military support of both Hezbollah in Lebanon and the Houtis in Yemen–the ballistic missiles recently fired into Saudi Arabia by the Houtis is an excellent example. Nor has Iran been on sidelines since the signing of the nuclear agreement touted by Kerry & Obama. While a case could be made that their nuclear facilities in-country meet the terms of the agreement, they have been relatively active in their pursuit with–and assistance to–the North Korean’s nuclear ambitions. Their own pursuit of improving their own ballistic missile technology also poses a threat similar to that of the NORKs (while not necessarily of the ICBM-type, certainly medium range missiles). 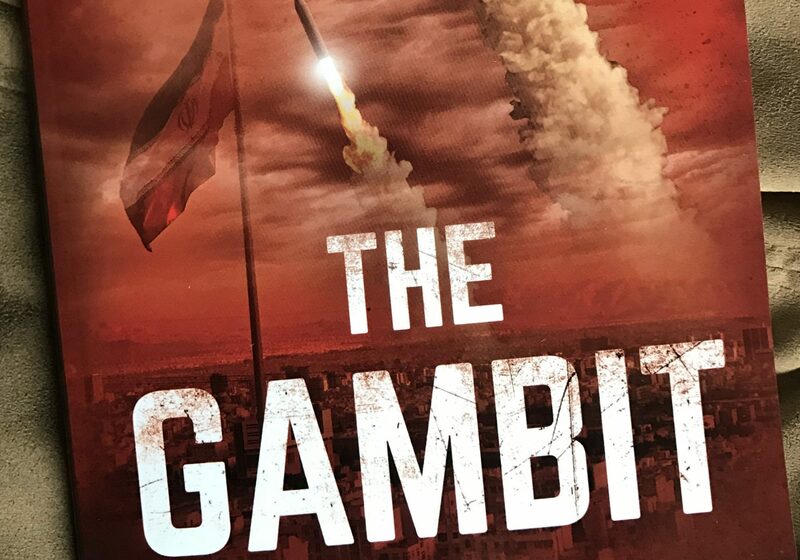 Indeed, Obama’s nuclear agreement does not prevent the Iranians from obtaining a nuke–it only formalizes the “kicking the can down the road” for 10 years (now about 7 or 8). The Russians have been relatively silent since Obama left office. Admittedly, they have continued to expand their presence in Syria at the Latakia naval base and it is looking like they might try and make this permanent. However, in Obama’s second term in office, when Obama indicated to President Medvedev that he’d have “more flexibility” in regards to Russia, the Russians essentially annexed the Crimea and invaded the Ukraine, absorbing almost a tenth of this country–with virtually no response from the Obama administration. What many people don’t realize is that the Russian role in the Ukrainian rebellion continues (The Guardian actually refers to this as “Europe’s forgotten war.”). I don’t see Putin playing as much of a threat to the rest of Eastern Europe until the situation in the Ukraine settles down. Moreover, I think Russia will pose a greater threat in the Middle East than they currently do in Eastern Europe. For example, when was the last time a NATO member country purchased an advanced Russian air defense missile system–as Turkey recently did. In Syria, I don’t see the country “falling” as such, though it might not be the Syria it once was–though the same may not be able to be said for Bashar al-Assad. Now that Putin has his naval base in the eastern Mediterranean, I don’t see him giving this up very easily. While China’s help is practically required with the NORK’s, it remains a serious threat elsewhere in the region–Taiwan and in the South China Sea especially. 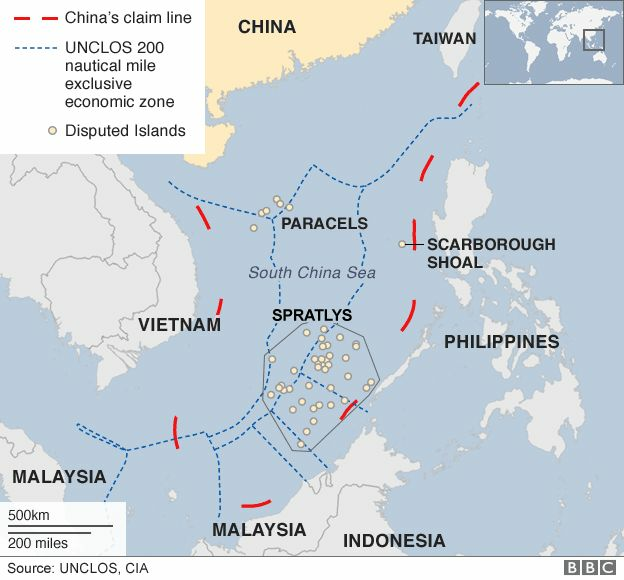 The map below clearly shows the extent of the issue with the South China Sea as indicated by the dashed red line. China has already established–and fortified–at least three man-made islands amongst the Spratly Islands, complete with missile defense and runways. The main issue with China’s claim here is the threat posed by the control of the seas. The Strait of Malacca (not visible on the above map but would be off the lower left corner) is a very strategic waterway, control of which could seriously restrict, or threaten, trade–and oil–to many of our allies in the region. Obviously, several other countries in the region have a claim, and probably a stronger one at that, to the Spratlys, notably, Malaysia, The Philippines, and Vietnam. China’s dogged claim to this region presents a threat more to American allies than to the US itself but American interests are at stake as well, especially when it comes to trade and freedom of the seas.